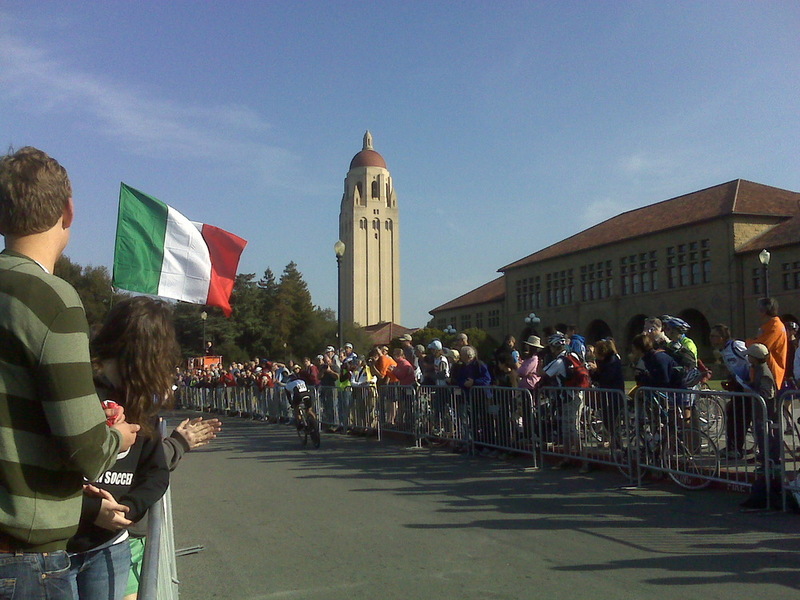 20,000 cycling fans witnessed an exciting day of racing on the Stanford University campus as the week-long Amgen Tour of California (www.amgentourofcalifornia.com) kicked off on Sunday, February 17th. The World Champion Fabian Cancellara (CSC) won the prologue Sunday as one of the first major races of the 2008 season commenced. The grand tradition of international cycling has been rocked with scandal of late, with allegations and convictions of drug enhancement eating away at a sport that has a long and storied history. The Tour of California, in its third year, has become one of the significant showcases in America for the international competitors. Sponsored somewhat ironically by a drug company, the 2008 Tour seemed to give racing a fresh start and new hope, and American fans something to cheers about. With last year's issues causing a number of teams to disband, the deck was shuffled, the players scattered and new teams have emerged. On the other side of the coin is a new team of castaways, outlaws, or as a friend put it, the Raiders of cycling, the Rock Racing team (www.rockracing.com). Clad in uniforms that feature a skull and cross bones-type logo created by sponsor Rock & Republic clothing, they are the veterans of swagger, some of whom have a tarnished past, such as Tyler Hamilton and Oscar Sevilla. (Dethroned Tour De France winner Floyd Landis may also join.) While a couple of these riders were not allowed to race the Tour of California due to pending legal situations, the stars to watch from Rock Racing this week are American Fred ‘Fast Freddie’ Rodriguez, long an unsung hero of US cycling in Europe, along with the self-declared ‘Sexiest Man in Cycling’, Mario Cipollini, former world champ (who allegedly owes 1.1 million euros in back taxes.) ‘Super Mario’ returns to racing after a two-year retirement, and at 41 years old, he’s fit and keeping pace with the youngsters, 20 years his junior. As with any great sporting adventure, you watch because you hope to see something you never have seen before. 2008 will certainly hold true as it’s a new road for international cycling, and the season has just begun - Viva le velo! For more on the Amgen Tour of California which will finish in Pasadena on February 24th - you can watch the action nightly on Versus Network (www.versus.com) or follow the stages at www.velonews.com or www.amgentourofcalifornia.com.